Call me crazy, but I was worried. Worried about the ability of Ball State football to rally and defeat a subpar opponent. Worried about the stick-to-it-iveness of this program to be able to overcome a losing streak. Worried about the coaching staff being able to motivate a squad of Cardinals to forget about the fluke losses and bad luck that they’ve had to endure. Worried about the mounting pile of injuries. Worried about a lot of things. Would the Cardinals get up early and let it slip away as was the case against Eastern Michigan? Would the Cardinals get down early and face an uphill climb the rest of the game like Western Michigan? Would the Cardinals have a few freak plays ultimately decide the outcome like Purdue? Or would the Cardinals come out and step on the gas and never look back like Central Michigan? The answer is really none of the above. Today was it’s own kind of day for the Cardinals, and yet again a different sort of game for the fans to witness. You had Akron scoring first, BSU rattling off 16 straight, Akron coming back, a back and forth second half, and two overtimes that featured the kind of “luck” that normally goes against the Cards when a BSU touchdown bounces off an Akron defender in double overtime, followed by Joshua Howard intercepting Akron during their possession, ending the game. I can’t say I’m exceptionally jazzed that one of these nip and tuck type games was the result of suiting up against a winless, hapless Akron, universally considered one of the worst teams in the FBS, but regardless of the ingredients or the preparation, the winning meal was quite delicious. It wasn’t a dominating wire to wire victory for the Cardinals that left no doubt as to who the “better” team was, but it was a win. And after four straight losses, a win was certainly needed. What made that win possible? Performance. Performances from new faces and old faces alike, as statistically the Cardinals were led by both freshman and 6th year seniors in various parts of the game. The rushing attack saw the return of Quale Lewis, who carried 23 times for 72 yards. It was the most carries all season for Quale, and the second-highest rushing total of the year behind the 96 yard performance at Toledo. Keith Wenning didn’t put up gigantic numbers (217 yds, 3 TDs, 3 INTs) but did what he had to do, including finding Jack Tomlinson over and over and over to the tune of 7 catches for 175 yards and 3 TDs. Could Wenning to Tomlinson be the next version of Davis to Love? It very well could be and that should scare the rest of the MAC. Defensively, the Cardinals certainly held their own, holding Akron to 358 total yards. The pass defense for the Cardinals was certainly refreshing, not getting significantly burned and also forcing 3 INTs. Robert Eddins provided the pressure up front with the Cards’ only sack as well as two tackles for loss. Derrick Henry, Charlie Todd, and Joshua Howard all picked off an Akron pass with Howard’s INT serving as the game clincher in the second overtime period. Kicking-wise, Ian McGarvey went perfect in his extra points and field goals, per usual, and Scott Kovanda averaged over 40 yards per punt. There were things of course that didn’t go extremely well for the Cardinals, like the 5 turnovers or the kick return that ended up being the longest onside kick I have seen after a muffed pooch kick catch attempt, but the bottom line is that the Cardinals won. At this point, that’s really all I care about. I truly believe that a large majority of the fanbase would have given up had another winless team beaten Ball State with some on the team following suit, but thankfully, that isn’t a theory that we’ll get to test. 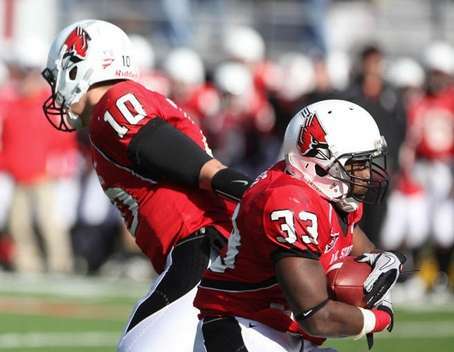 The Cardinals now sit at 3-7, 2-4 in the MAC, and have two remaining games that could not only build momentum for 2011 and close 2010 on a good note, but ultimately play a role in the MAC Championship. First up is a very winnable Friday night road contest at Buffalo. The Bulls check in at 2-7, with a 1-4 MAC record, so this is not an unwinnable contest. Then the Cards close on 11/20 with Northern Illinois at home, the same Huskie team that is locked in a battle with Toledo for the right to represent the MAC West in the MAC Championship. So was it pretty? Nope. Was it a win? Yep. And considering the last two years in Cardinal nation, a win, any win, is a great thing.